Enter Nnamdi Kenny Okwu Kanu, the new kid on the block. The above quote by a great thinker, Roy T. Benett captures the power of vision and self-belief, which the British-Nigerian political activist now represents. He is a man of the moment and hate or love him, his name has got stuck in the minds of the majority of Nigerians. And perhaps no name in the country today rings a bell like that of the prisoner of conscience. Surprisingly, before now, Kanu who doubles as the leader of the Indigenous People of Biafra (IPOB) and director of a London-based radio station, Radio Biafra was literally unknown in Nigeria. But out of the blues, the Abia State born activist became a household name when on October 14, 2015, he was arrested by the agents of the Federal Government, the Department of State Security (DSS) in his hotel room, Golden Tulip Essential Hotel, Ikeja, Lagos State on treason charges. He was thereafter detained in jail. His arrest and detention marked the beginning of the making of today’s Igbo hero. Many would agree that since his arrest on that fateful day, the popularity of the young man with a heart of steel has soared like an eagle. Kanu was born in Isiama Afara, Abia State, Nigeria. His father is Eze Israel Okwu Kanu and his mother Ugoeze Nnenne Kanu. He attended Library Avenue Primary School (now part of Government House, Umuahia) and went to Government College Umuahia for his secondary education. The freedom fighter later gained admission to the University of Nigeria Nsukka (UNN), where he could not finish due to incessant strikes before he left for London to complete his tertiary education. By 1987, Nnamdi was merely an innocent Geography major, resident at Akintola Hall of the UNN. Not given to half measures and as one of those gifted in the pursuit of their dreams, Nnamdi’s path would prove to be thorny, uncommon and epochal. It is little wonder that he did not have the patience to tarry along with other normal students before going abroad for his studies. While in London, Kanu became an activist and freedom fighter with the sole aim of liberating the people of Biafra who he believes are being oppressed in Nigeria. One of the greatest instruments he deployed to achieve that dream was the Radio Biafra with which he continuously lampooned the Federal Government. A man of his conviction, he took his activities to the extreme and did not pretend that he could even pay the supreme price for the liberation of his people. The IPOB leader was once quoted to have said he is an Igbo Jew, part of a group who believe they are descendants of the lost tribe of Israel who settled in West Africa. Speaking ahead of the 50th anniversary of Biafran war to Al-Jazeera despite being banned by the court not to grant interviews, Kanu had made it clear that the demand for the secession of Ndigbo from Nigeria is because the nation seems not to be functioning and can never function. He decried the marginalisation of the Igbo in Nigeria, saying that they have been prevented from aspiring to assume important positions in the country. Kanu like in the words of Philip Brooks, believes that, “no man has come to true greatness who has not felt that his life belongs to his race, and that which God gives to him, He gives him for mankind”. For Kanu, many believe that heroism was thrust on him by President Muhammadu Buhari’s administration following his arrest, detention and eventual release on bail. The news of the arrest of Mr Kanu generated protests across parts of Delta, Enugu, Rivers, Cross River, Abia, Imo, and Anambra states. The argument is that the activist has been operating long before the All Progressives Congress (APC) government came on board and many Nigerians hardly knew that any name like Nnamdi Kanu ever existed. The permutation is that the strategy adopted by the government through the Department of State Security (DSS) magnified IPOB, which Kanu leads and shot his popularity up to high heavens. His popularity rating was boosted when he was denied bail after orders to do so by several courts of competent jurisdiction. Kanu was arraigned by the DSS on November 23, 2015 in an Abuja Magistrate Court for the first time for charges of “criminal conspiracy, intimidation and membership of an illegal organisation.” The charges, they said violated “Section 97, 97B and 397” of Nigeria’s penal code. On the date of the case, Kanu’s supporters stormed Abuja in luxury buses on a peaceful protest for their leader who was arraigned before the Wuse Zone 2 Magistrate Court with placards amid dancing and singing outside the court premises whilst hearing proceeded. Protesters wore T-shirts and caps with inscriptions like “Biafra Now or Never”, “Buhari Release Kanu For Us”, “On Biafra We Stand”. The government ignored initial court orders calling for Kanu’s bail before bowing to the recent one, which eventually led to his release on bail, on April, 28, 2017. But the bail conditions were harsh as the IPOB leader was banned from public speaking, granting press interviews or being in a group of more than 10 people. As a condition of that bail, Kanu was also asked to bring a prominent Igbo leader, a wealthy resident of Abuja and a senior Nigerian Jewish leader to provide N100m ($260,000; £200,000) each as surety to the court. So, from the government’s perspective, Kanu is an enemy of the state whose activities should be nipped in the bud. But for very many others, he is a hero and a prisoner of conscience. While he was in prison, many prominent Nigerians including Governor Ayo Fayose of Ekiti state, former governor of Abia State and eminent businessman, Dr Orji Uzor Kalu, former governor, Central Bank of Nigeria, Prof Charles Soludo among others visited him and further made him a celebrity even while in detention. 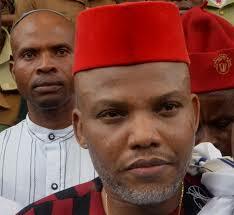 Among Ndigbo worldwide, particularly in the South East zone, Kanu has become a small god. In the social media, pictures of those who are short of worshipping him like a deity have often appeared in some platforms. His Abia State home has become a Mecca of some sorts. Going by the figures from Amnesty International, more than 150 Igbo youths were martyred in the struggle for his release. Many still wonder why the leader of IPOB has overshadowed his counterpart and founder of the Movement for the Actualisation of the Sovereign State of Biafra(MASSOB), Chief Ralph Uwazuruike. Not a few believe that the average Igbo youth sees Kanu as the new face of the Biafran struggle unlike Uwazuruike who had been around over the years with allegations of having compromised the spirit of the fight for liberation. The youth in the South East see him as the true son of Biafra having remained unbowed despite the intimidation and harassment in the hands of the state. Kanu is worshipped and deified because in the eyes of many, he did what many Igbo leaders were either too afraid to do or unwilling to do because of their selfish interests. He dared to be different and spoke out against the powers that be whose project appears to have been to always put the Igbo at a disadvantage in the nation’s scheme of things. Many believe that Kanu has successfully taken up the gauntlet and waged a mind war against the establishment, hence his popularity among the Igbo masses. On Tuesday, May 30 , the entire South East was shut down following the sit-at-home order by the Kanu’s IPOB, to mark the 50th anniversary of the declaration of the defunct Republic of Biafra and to honour heroes and heroines of the struggle. Apart from the East, the directive was partly complied with in Port Harcourt, Asaba and Bayelsa but ignored in Uyo. Most markets, banks and schools in Abia, Anambra, Ebonyi, Enugu and Imo states, including those in the rural areas, were closed and the roads were totally deserted in the early hours of the morning. In Enugu, the order was also largely complied with as schools, banks, markets and other commercial activities were paralysed, with police helicopters hovering around the state capital. The shutdown of the states was in spite of the plea by South-East governors and massive police and security presence, who patrolled streets and carried out air surveillance with helicopters to ensure that there was no breakdown of law and order.